This little piece of history was just for sale on Ebay. It’s a postcard from W. Harding to Elsie Holgate in Longmire Springs (the area seven miles outside Mount Rainier National Park). 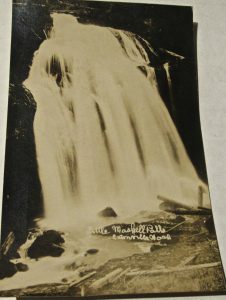 It’s a shot of the Little Mashel (Mashell) Falls, which is still a popular hiking spot today on Pack Forest property. This is extra special because Longmire Springs is relatively unheard of today. “In 1883 James Longmire built a trail from Succotash Valley in Ashford 13 miles (21 km) to the hot springs where he built cabins in the area which now bears his name. John Muir described staying there on the way to his ascent of Mount Rainier in 1888. The oldest surviving structure in the National Park is a cabin built by Longmire’s son Elcaine Longmire at the springs in 1888. It is located north of the road in the area now called Longmire Meadows. From 1899 to 1904 approximately 500 people a year visited Longmire Springs in the summer months. They reached the area by train to Ashford and then on Longmire’s wagon trail. Cool photo. Note, however, that in 1914, Longmire Springs was not “the area which would eventually become the Mount Rainier National Park,” it was in fact seven miles inside a national park that was already 15 years old. And while in 1904 it had 500 visitors per year, today more than a million tourists annually pass through this “relatively unheard of” site. Thanks!!! I’ll make the correction!